Qt supports both simple and extended radial gradients. 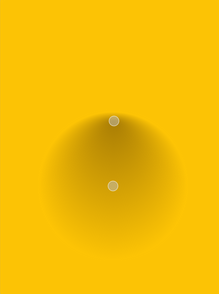 Simple radial gradients interpolate colors between a focal point and end points on a circle surrounding it. Extended radial gradients interpolate colors between a focal circle and a center circle. 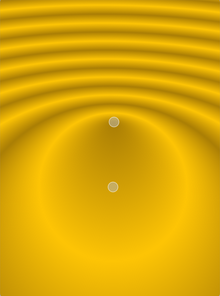 Points outside the cone defined by the two circles will be transparent. For simple radial gradients the focal point is adjusted to lie inside the center circle, whereas the focal point can have any position in an extended radial gradient. 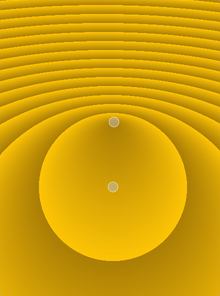 Constructs a simple radial gradient with the center and focal point at (0, 0) with a radius of 1. Constructs a simple radial gradient with the given center, radius and focalPoint. Note: If the given focal point is outside the circle defined by the center point and radius, it will be re-adjusted to lie at a point on the circle where it intersects with the line from center to focalPoint. Constructs a simple radial gradient with the given center (cx, cy), radius and focal point (fx, fy). Note: If the given focal point is outside the circle defined by the center (cx, cy) and the radius it will be re-adjusted to the intersection between the line from the center to the focal point and the circle. Constructs a simple radial gradient with the given center, radius and the focal point in the circle center. Constructs a simple radial gradient with the center at (cx, cy) and the specified radius. The focal point lies at the center of the circle. Constructs an extended radial gradient with the given center, centerRadius, focalPoint, and focalRadius. Constructs an extended radial gradient with the given center (cx, cy), center radius, centerRadius, focal point, (fx, fy), and focal radius focalRadius. Returns the center radius of this radial gradient in logical coordinates. See also setCenterRadius() and QGradient::stops(). Returns the focal radius of this radial gradient in logical coordinates. See also setFocalRadius() and QGradient::stops().